Illustrations note 12 Tables, black and white; 3 Illustrations, color; 95 Illustrations, black and white; XVI, 354 p. 98 illus., 3 illus. in color. Understanding how healthcare is being transformed by IT is key to the improvement of medical standards and reduction of cost. The synergy between computer technology and medical services allows fascinating new possibilities for benefit in areas such as continuing care, chronic disease treatment and home monitoring, bringing with it the promise of essential changes in existing models of care delivery and system performance. 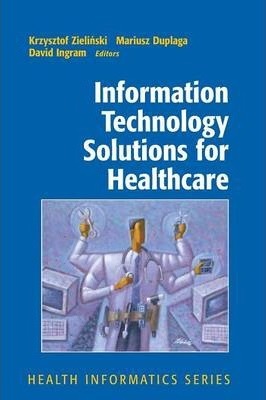 This book presents the current and future trends in the transformation of healthcare services in the Information Society Era and is of great relevance to informatics professions, clinical managers and all clinicians using these new technologies as part of their practice. Information Technology Solutions for Healthcare addresses the priorities within international informatics and presents a thorough survey of the most promising e-health technologies, including internet-enhanced healthcare services and mobile technology via modern wireless technologies. It is illustrated with case reports identifying real applications of the techniques and focused on providing an integrated overview of e-health and medical, sociological and technical aspects of the application of e-health technologies. The idea of publishing the book on the use of information technology for improvement of healthcare delivery systems from the PRO-ACCESS initiative (ImPROving ACCESS of Associated States to Advanced Concepts in Medical Telematics, IST-2001-38626) focused on the better access of new associated countries (now countries accessing European Union) to modern e-health technologies developed in leading European centers. The book brings a comprehensive view of all those areas in which application of computer and telecommunication technologies have or will have in near future extensive impact on the quality and availability of health care services. It is addressed to broad audience of readers representing health professionals community, related professional environment, managers and policy-makers focused on health maintence problems. The PRO-ACCESS initiative focuses on creating a platform for promotion, dissemination and transfer of advanced health telematics concepts and experiences from development and deployment of telemedicine solutions to NAS. To achieve this, a Centre of Competence will be established to broaden the formula of the Krakow Telemedicine CoE existing in Poland, in order to coordinate publishing activities, events, trainings and intake of solutions from cooperating partners within EU and NAS. The main impact of the Centre will be a substantially improved awareness of state-of- the-art medical telematics technologies in NAS. The Krakow Telemedicine CoE will be thereby strengthened by increasing its networking with leading RTD centres in EU and NAS, and by training of research and professional staff of the Centre and target user groups of e-health solutions developed in the CoE.